When I first made this recipe (based on this from Return to Sunday Supper) I knew it’d be a keeper. Since then I’ve made it at least three times and have been asked for the recipe twice. So for those who asked, and for those who haven’t yet experienced the spicy, savoury goodness of these BBQ shrimp, here it is. Make sure to have a loaf of good quality bread to sop up the sauce with. I serve mine with an oil & vinegar coleslaw and sometimes boiled new potatoes to make a complete meal. It makes for a super easy week night dinner (since it’s assembled ahead of time) or a great company dish. Thaw the shrimp as per package instructions and remove the shells. In the microwave, melt the butter in a large cereal bowl and then add the remaining ingredients except the lemon and the shrimp. Return to the microwave and cook for another 2 minutes. Let the mixture cool while you place the shrimp in a single layer in either a 9×13 pan or two 8×8 pans. When I’m doing this on the BBQ, I like to use disposable foil pans for ease of cleanup and so my ‘good’ oven pans don’t get damaged. If you’re opting to use the oven, any glass or metal pan will do. 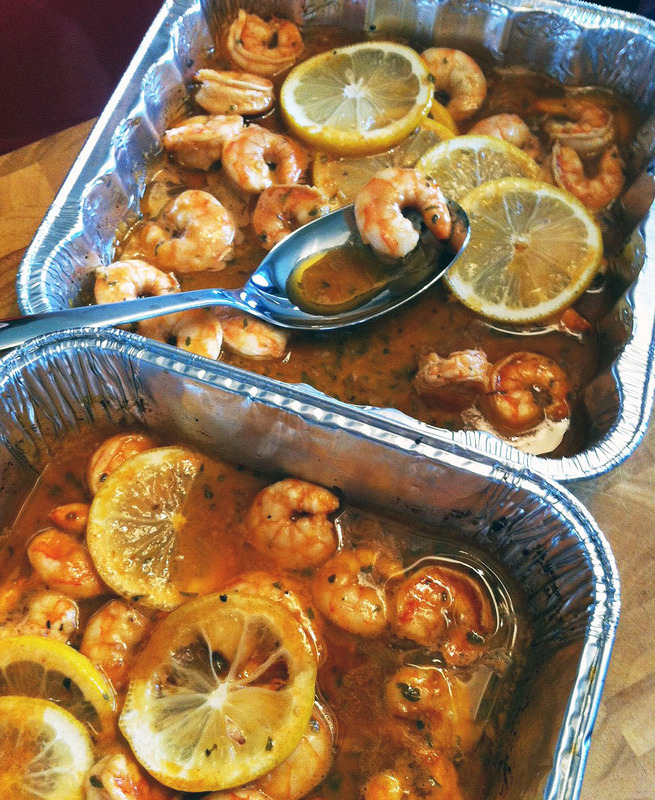 Pour the slightly cooled mixture on top of the shrimp, stir to coat all sides and top with the lemon slices. Cover and refrigerate for at least 4 hours or overnight. When ready, bake on the BBQ or in the oven at 400 degrees for about 15 minutes. When done, the shrimp will be pink and have curled up. Be careful not to overcook! When the shrimp are ready, I bring the whole pan directly to the table and set it on a wooden cutting board so guests can serve themselves and dip pieces of bread directly into the sauce. NOTE – As is, the recipe has a little heat to it, but those of you who like fire may want to add a squeeze of sriracha.